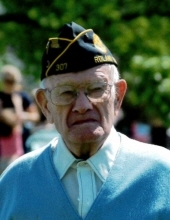 William “Bill” Jerome Waugh, age 87, of rural Radcliffe, passed away on March 18, 2019 at the Greene County Medical Center in Jefferson. Born on March 16, 1932 on the family farm near Radcliffe, Bill was the son of Erick and Celia (Rierson) Waugh. His father passed away at a young age, which required Bill and his brother to look after their mother and the farm. They farmed the ground, planting and harvesting with a team of horses. Bill graduated from Roland High School in 1950. He then enlisted in the U.S. Air Force as a mechanic. While in the Air Force, Bill went on a blind date with Manita Mattison in Salina Kansas. They were united in marriage on September 15, 1957. Bill was a farmer all his life in the Radcliffe area. He enjoyed bringing family together and was always helping someone in need. Bill had a special love for airplanes and also enjoyed taking his family boating. Bill was a member of the Roland American Legion Post #307. He was also a member of the Salem Lutheran Church, where he was a regular usher. Bill is survived by his wife, Manita; a son, Paul Waugh of Radcliffe; a daughter, Cynthia (Tracey) Carpenter of Radcliffe; 2 grandsons, Logan (Haley) Carpenter and Lucas Carpenter; a nephew, Mark (Cathy) Waugh; three nieces: Gloria (David) Nutt, Julie (Kevin) Briden, and Joy (Tom) Brooks; and a sister-in-law, Verla Waugh of Waterloo. He was preceded in death by his parents; a brother, Richard “Rich” Waugh; a half-brother, Eric “Bud” (Marge) Waugh; and a half-sister, Betty (Grant) Quam. A memorial service will be held at 2:00 P.M. on Monday, March 25, 2019 at Salem Lutheran Church in Roland with Pastor Dennis Sandmann officiating. Visitation will be held for one hour prior to the service. Burial will be at a later date in the Roland Cemetery with military honors by the Roland American Legion. Funeral arrangements are under the direction of the Soderstrum Funeral Home in Roland and online condolences may be left for the family at www.adamssoderstrum.com. In lieu of flowers, memorials may be directed to the family. To send flowers or a remembrance gift to the family of William "Bill" Jerome Waugh, please visit our Tribute Store. "Email Address" would like to share the life celebration of William "Bill" Jerome Waugh. Click on the "link" to go to share a favorite memory or leave a condolence message for the family.